Mashed potatoes rank high on the list of American comfort foods for everyday dinners as well as special occasions; some people feel Thanksgiving isn’t Thanksgiving unless there are mashed potatoes on the table. But while this dish may seem like a straightforward recipe, there are a number of factors and certain techniques that will affect the outcome of this beloved side dish. From selecting the type of potato to what you do with them before mashing, following certain tips will assure you will have creamy, instead of gluey, mashed potatoes. Of course, the main ingredient in mashed potatoes is potatoes. But not just any potato will result in perfect mashed potatoes. Choosing the right variety to achieve the desired result makes a big difference in your chance for success. If you want smooth and creamy, you should look for certain types of potatoes while deliberately chunky (called "smashed" potatoes) potatoes will require different varieties. According to many home cooks and chefs alike, Yukon Golds are the ideal potato for mashing. Moderately starchy and more flavorful than russets, Yukon Golds yield a creamy yellow mash with a naturally buttery taste. Of all of the varieties of potatoes, Yukon Golds have the most uniform and densest flesh and don’t become watery, mushy, or grainy when cooked. Another bonus is their size—you can boil smaller Yukon Golds whole, which prevents the absorption of water, the bane of a fluffy mashed potato. Many people, however, naturally reach for the russets when they make mashed potatoes. Unfortunately, their high starch content causes them to absorb a lot of water, making for watery mashed potatoes without a lot of flavor. If you would like to use russets, just do your best to drain the potatoes thoroughly and allow them to dry out before mashing. 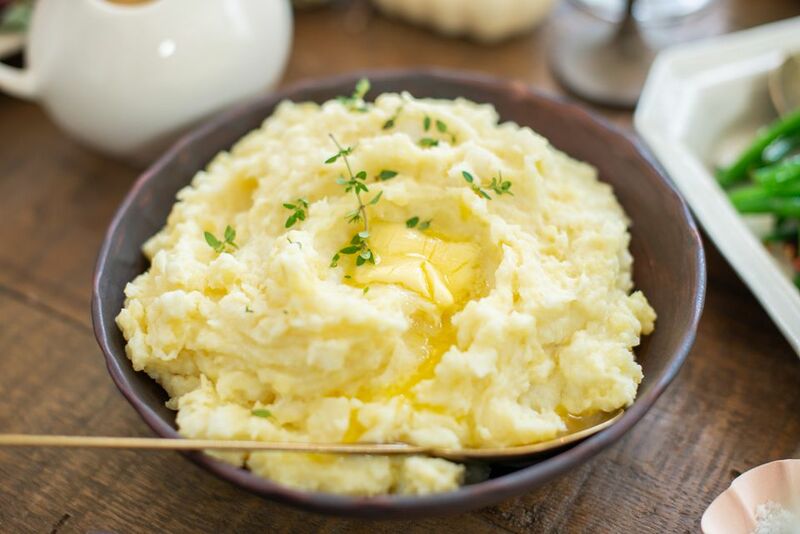 Keep in mind that because of this moisture content and since russet potatoes (also labeled Idaho potatoes or bakers) tend to have a very mild taste, it can be challenging to create flavorful mashed potatoes, even when you are adding other ingredients. Waxy potatoes, such as red and white varieties, do have a lot of flavor but work best for potato salads or other dishes benefiting from larger chunks that hold their shape. The lower starch content and higher moisture in these potatoes make them resistant to mashing and less able to absorb butter and cream. However, red skin potatoes do work well for a more rustic skin-on mash with a chunky texture. Once you have your potatoes, it is important that you follow a few steps to assure you will have the best mashed potatoes in the end. With either russets or Yukon Golds, you can use a potato masher for a "smashed" result, or a ricer or food mill for a silkier effect. Just do not put potatoes into a food processor or blender or use a hand mixer to whip them and expect to achieve fluffy mashed potatoes. Those appliances handle the potatoes too rigorously and can turn them into a mound of paste. Incorporating a couple of additional tips into your potato preparation can help prevent gluey mashed potatoes and create the creamy and fluffy results everyone loves. Potatoes can retain a lot of moisture, so making sure they have completely dried out after boiling is important. There are two ways of doing this: After you drain the boiled potatoes, you can put them back into the empty, hot pot and shake it gently to evaporate any lingering moisture. Or spread them on a cookie sheet and put them in a 250 F oven until they feel completely dry to the touch. If you are adding butter and cream to the mashed potatoes, it is best that they are not cold. Gently heat the butter and cream before you add them to the potatoes, adding the butter first so it has time to melt and incorporate fully into the dish.